Many endangered birds sold as captive bred have actually been caught in the wild and smuggled out of their original habitats under cruel conditions, according to a July 2012 report from the Wildlife Trade Monitoring Network (TRAFFIC). More than 54,000 birds, mainly parrots and cockatoos, were imported from the Solomon Islands between 2000 and 2010 as ‘captive bred’. These included birds non-native to the Solomon Islands. However, local authorities confirmed to TRAFFIC that the islands have no substantial bird breeding facilities and that registered bird breeders there mainly use their premises as holding sites for illegally caught wild birds bound for export. 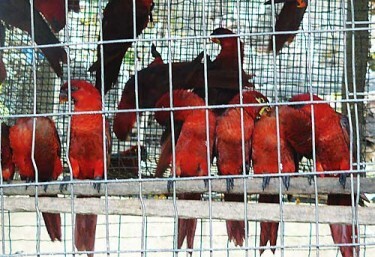 Thousands of native Solomon Islands birds were exported as captive bred. Image from TRAFFIC. Birds are drugged with phenobarbitol or valium, stuffed into short lengths of plastic or wire mesh tubing, then put into suitcases modified to allow air circulation and be carried by hand. They are then taken on normal passenger flights to intermediary places like Singapore or Thailand or to their country of destination. Although the above three countries listed have domestic regulations to stop illegal trade of wild birds, enforcement of the law is not effective. So what has gone wrong in these countries? Singapore became a Signatory to CITES in 1986. Under the Endangered Species (Import and Export) Act, it is an offence to import and export any endangered species without a permit. Any person or company caught violating the law will be prosecuted in Court and subjected to a large fine or even imprisonment. Prohibited wild animals continue to be advertised for sale as pets in Singapore over the internet, which is also an offence under Singapore law. The Convention on International Trade in Endangered Species of Wild Flora and Fauna (CITES) lacks teeth to protect species against illegal traders act. It is only a treaty and not a law enforcement body with its signatories expected to implement the treaty’s provisions through domestic legislation and agencies [..] Its challenge is to muster the political support necessary to push wildlife trafficking on national agendas and stir law enforcement officials into effective action. The war against traffickers must be waged at the highest level of government. The association also urged consumers to take action and stop the trade. Taiwan is flooded with illegal traded wild parrots. The bird stores that sell wild parrots can be found everywhere. The wild parrots are smuggled from other countries to Taiwan in extremely cruel manner, and many do not survive the process. Through secret channels, the traders of wild birds manage to obtain legal documentation and “legally” import them to Taiwan [..] There is no way to crackdown on the illegal traders once they obtain legal documents for their birds. Only a few bird stores give up the opportunity to profit from selling smuggled wild parrots, because the exported captive breeders usually are more expensive than the wildly caught birds. In the present market of pet birds, 70% of the birds are parrots. The annual export value of parrots is about seven thousand million Taiwan Dollars (about 232 million USD). However, there are no statistics about the domestic market [..] How many parrot breeding facilities are in Taiwan? How many stores are selling parrots? How many parrots are in the market? No one knows [..] Most of the parrots from the large breeding facilities are sold to Korea, Middle East, the United States, and Mainland China. This report also explained that to differentiate between birds bred legally in Taiwan and smuggled birds, from April 2011, the Taiwanese government has assigned individual parrots a distinctive ID.